"Ugh, am I talking too much? It feels like I'm just rambling!" "Can she tell that I'm nervous? OMG I'm sweating like crazy." "I feel like an idiot. Why am I even doing this to myself?" "Everyone else is so much better at this than me. She'll probably go with a competitor instead. Crap!" That's your brain spiraling into fear during sales conversations. 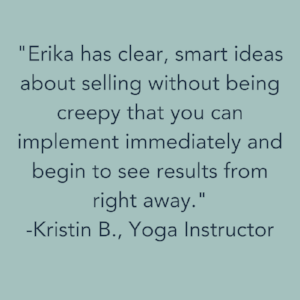 Join me for my FREE class Confident Conversations: How to Sell More Without Feeling Pushy and learn how to make sales conversations easier and more effective. Imagine if your sales conversations felt more like having coffee with a friend. What if you could be calm, cool, and collected, your words flowed easily, and you always said the right thing? Wouldn't it feel amazing to walk away with the sale AND your confidence intact? When you join me for my FREE webinar you're going to learn simple sales tips you can use right away in your business. You'll figure out how to have sales conversations you can feel great about, instead of being filled with dread. Not only will clients feel good about spending money with you, but they'll actually thank you for your time and help. Simply register below and I'm going to give you my best tips for better sales conversations. And you can learn them in less than 30 minutes! Seriously! As a bonus, you'll be getting extra goodies from me sent to your inbox. Feel empowered and confident in your business, because the world need what you have to offer! Still not sure this is right for you? Worried about taking the time to watch another training that's just "meh?" Yeah, I've been there too. I've been selling for over 20 years and I love it! Sounds really weird right? I've just learned to sell in a way that feels easy and relaxed. I've sold many different things over the years and taught tons people how to sell successfully. If a super nerdy, Tolkien-loving, tattooed misfit like myself can figure this out, I know you can too! But why do I care if your business is making money? Well, that's simple. I believe in the power of passionate entrepreneurs. I believe small businesses are the backbone of our world and can have positive impacts on both the people who run them, and on the communities they serve. Click to save your spot!